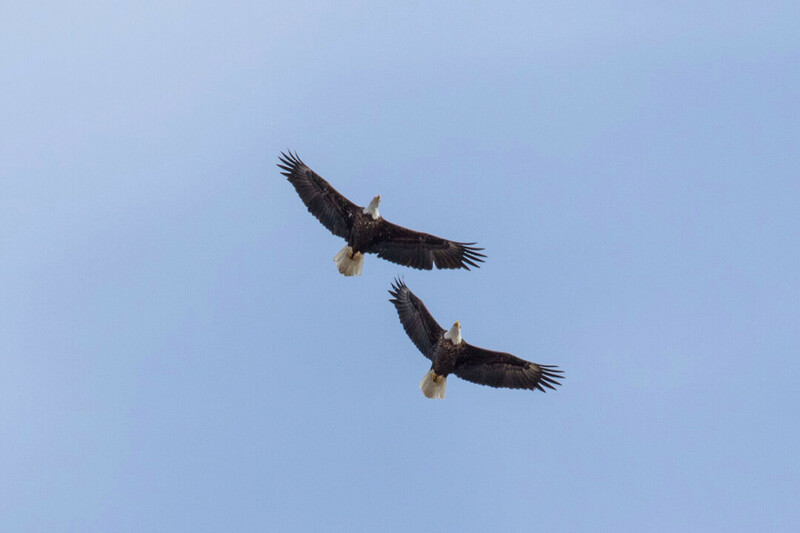 Bald eagles soar near Wabasha, Minnesota. Armed with sandwiches, binoculars, and a couple of cameras, the three of us hit the road. It’s spring break, and to celebrate, a pair of buddies and I hop in a truck and head west – ignoring the allure of Floridian beaches and opting for a lesser-known spring break destination: Wabasha, Minnesota. We are in search of eagles, and having received a hot tip that they congregate along the Mississippi River this time of year, that’s exactly where we went. From my place in the backseat, I hold my pen at the ready, anxious for the bird count to begin. Three, in fact, each of which I soon reduce to a tally in my book. “Should we pull over?” my buddy in the driver’s seat asks. I base this decision off an apt expression I’d often heard before: that a bird in the hand is worth two in the bush. (Or in our case, three birds in a tree are better than nothing.) However, my friend in the driver’s seat feels differently, ignoring my “sure” and promising we’ll likely see plenty more ahead. It’s a gamble I’m less inclined to take. After all, it’s possible we’ll spot more eagles, but it’s hardly a guarantee. Me being me, I can’t help but transform our eagle outing into a full-blown existential crisis. What does it say about me that I’m so quick to settle? I wonder. And what does it say about my buddy that he isn’t? I wasn’t always this way. In youth, life’s excitement often came by way of not knowing what proverbial bird might be perched right around the bend. Though as I teeter toward middle age, it’s the “not-knowing” that’s cause for concern. Maybe the grass is greener on the other side, but maybe, too, that grass is full of landmines. No, I sigh. I cannot. Upon entering Wabasha’s city limits, we head north along the Mississippi, stopping at every pull-off to spot eagles in the trees. Soon my tally is well over 100 – mostly bald eagles, but a handful of goldens, too. On the shores of Lake Pepin, my humbling continues. In one spot alone we more than double our eagle count; such an abundance of birds that our camera shutters can barely keep up. As we watch them dive bomb toward the water’s surface – always alighting with a fish – it’s hard to know what to make of them. There are simply so many, too many, their surplus ensuring that I can’t fully appreciate any single one. I quit my tally somewhere around 200. The universe had made its point. Half a lifetime ago, when I was 16, I worked at a pet store where, for reasons beyond my understanding, I was put in charge of thousands of dollars’ worth of exotic birds. I was responsible for the cockatoo, the macaw, as well as any other feathered friend equipped with a beak capable of breaking a broomstick. Which, admittedly, was an image I thought about often while tiptoeing into their cage after closing, placing the young birds in my hands and handfeeding them with a syringe. After several months of intense bird bonding, I was hired at a bookstore down the road. It was a dream job, one that not only ensured that I’d retain all my fingers, but also placed me, a budding writer, in close proximity with every visiting author. As I stepped into the manager’s office to inform her that I’d be leaving – that though I loved the birds, I loved books more – she spun around in her swivel chair and looked me straight in the eye. “One day,” she chided, “you’ll learn that ‘good enough’ is ‘good enough.’ ” Then, before I could rebut, she spun back around, returning her attention to her screen. Two weeks later, I said goodbye to my birds and took my chances on books. But a week into my new gig, I couldn’t help but return to the old one, anxious to visit a few of my feathered friends. The birds were fine, the employee informed me, but our manager wasn’t. She’d died of an aneurism days prior. From their place in the cage those birds stared at me, trying hard to read my expression. Head cocked, the macaw offered me a conciliatory coo, and all I offered him was a goodbye. I walked out of that pet store knowing that “good enough” would never be “good enough” again. Some days, I forget that. But when I do, the birds remind me.